Java developers typically go through four «stages» in mastering Java. In the first stage, they learn the language itself. In the second stage, they study the APIs. In the third stage, they become proficient in the environment. It is in the fourth stage —«the expert stage»— where things really get interesting, and Java Enterprise Best Practices is the tangible compendium of experience that developers need to breeze through this fourth and final stage of Enterprise Java mastery. Crammed with tips and tricks, Java Enterprise Best Practices distills years of solid experience from eleven experts in the J2EE environment into a practical, to-the-point guide to J2EE. Java Enterprise Best Practices gives developers the unvarnished, expert-tested advice that the man pages don’t provide—what areas of the APIs should be used frequently (and which are better avoided); elegant solutions to problems you face that other developers have already discovered; what things you should always do, what things you should consider doing, and what things you should never do—even if the documentation says it’s ok.
Until Java Enterprise Best Practices, Java developers in the fourth stage of mastery relied on the advice of a loose-knit community of fellow developers, time-consuming online searches for examples or suggestions for the immediate problem they faced, and tedious trial-and-error. 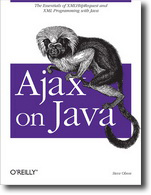 But Java has grown to include a huge number of APIs, classes, and methods. Now it is simply too large for even the most intrepid developer to know it all. 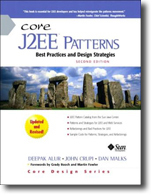 The need for a written compendium of J2EE Best Practices has never been greater. 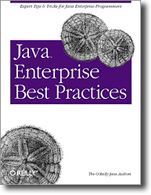 Java Enterprise Best Practices focuses on the Java 2 Enterprise Edition (J2EE) APIs. The J2EE APIs include such alphabet soup acronyms as EJB, JDBC, RMI, XML, and JMX.